This month’s talk promises to be absolutely fascinating! Whilst we normally focus on our local Cape vernacular, this month’s examination of the vernacular architecture, both sacred and secular, of Ethiopia will open an insight into an ancient African vernacular architectural tradition that responds to terrain, religious tradition and local materials. 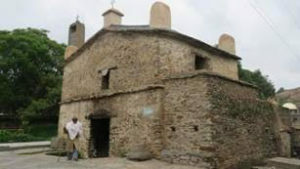 The illustrated talk looks at Ethiopia’s rock-hewn churches and monasteries, contextualizing them within their historical timelines, hybrid cultures and pre-Christian roots. The old gateway, and Maryam Tsion church where the Ark of the Covenant is said to be housed. Seen as living cultural resources by the locals, these fascinating and architecturally astounding edifices are found in the ancient towns, World Heritage Sites, and awe-inspiring mountain terrains of northern Ethiopia. Marion Ellis and Lauren Muller, having travelled to Ethiopia in July, share some recent images, sounds and embodied experiences involved in visiting this extraordinary slice of African history and design. They’ll also look at the functionality of Hidmo dwellings, agricultural compounds and stone terraces of the Tigray region, where dressed stone vernacular architecture is embedded within the ecologically challenging geographic landscape of abundant stone, scarce timber and water resources. The plan of the Biet Ghiorghis church that was carved out of the rock. Marion, has been a member of the Vernacs for many years and has served on the committee in various capacities. She studied languages and history of art at the University of Cape Town before creating Cape Insights that offers an in-depth look of South Africa’s cultural landscape via special interest tours in a variety of fields, including architecture. Lauren, also a Vernac member, trained as a clinical psychologist, with postgraduate African Studies. Her organization Contact Zone, researches and develop tourism routes and tours for alternative public cultures, history and memory. 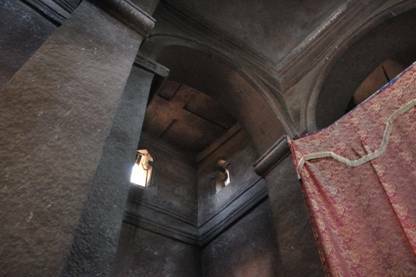 Biete Medhani Alem with its five aisles, is believed to be the largest monolithic church in the world, while Biete Ghiorgis has a remarkable cruciform plan. 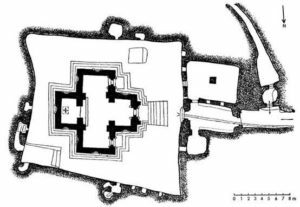 Most were probably used as churches from the outset, but Biete Mercoreos and Biete Gabriel Rafael may formerly have been royal residences. Several of the interiors are decorated with mural paintings.